York B&B offer you recharge batteries with our included breakfast mixing fresh bread and fruit, strong coffee, milk and tea. Enjoy this wonder city and country. Bolivia has different features that you must visit and we want to help you to take advantage of it. Book and reserve with us. Storage is available free of charge for our guests. you can leave extra luggage while you enjoy our variety of tours and trips within Bolivia. 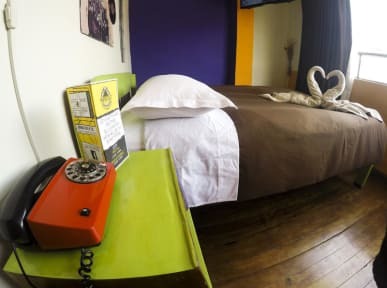 York B&B is conveniently located in the best and most traditional neighborhood of La Paz surrounded by good restaurants, cafes and bars with live music. As well, we are only four blocks from the Main Square, six blocks from the bus station, 10 minutes from the red line of the cable car and around 40 minutes to the airport. All the main city attractions are just right here such as the Witches Market, Coca Museum and handicrafts. Our vintage style is clearly represented in all of our decoration. Some of our rooms has a spectacular view of the surroundings of La Paz city that can be seen from your bedroom, combining rooms with private and shared bathroom and hot water 24 hours a day. Our unique beds with real duvets and custom made mattresses provide you a cozy ambiance such as home. Payment upon arrival by cash, credit cards, debit cards. We do accept credit and debit cards with a 2% recharge. (This property may pre-authorise your card before arrival). 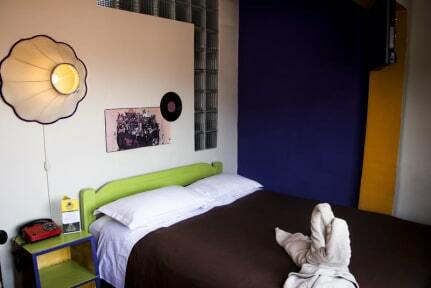 hot showers, good breakfast, comfortable beds and a perfect location! Schönes und komfortables Privates Zimmer, jedoch sehr klein. Sauberkeit ist sehr gut. Tolles Frühstück. Das Personal war eher kurz angebunden und nicht sehr gesprächig. Location was perfect. Dorm were tiny but private room was good. Not a real common area and no kitchen. Breakfast was not good at all. But the staff and the location is worth a stay. perfect located. staff very friendly. breakfast not that good. This hostel is really quite near the main plaza San Franzisco. The room Instayed was very tiny and had no window. But I only stayed for 1 night. Also there were only 2 Sockets for charging. The breakfast was okay and typical continental. The staff was very friendly and also helped to organize my bus to Uyuni. The washingroom is also very tiny but okay. Don’t expect to much than u will be fine. Das Frühstücksbüffet ist wirklich super! (Brot, Cornflakes, Yogurt, Milch, Früchte,... Eier kann man sich für 6 Bolivianos dazu bestellen) Leider ist es jedoch immer sehr laut, egal ob morgens, abends oder mitten in der Nacht. Die Wände sind so dünn, dass man wirklich bei jedem Geräusch aufwacht. Die Zimmer sind ok, wir mussten jedoch 3 mal Nachfragen bis der Mülleimer im Badezimmer endlich geleert wurde. Die Sauberkeit in den Badezimmern könnte besser sein. Das Gemeinschaftsbad im 2.OG ist sehr klein. Wir hatten ein DZ gebucht - jedes war ohne Verdunklungsgardinen und somit strahlte die gesamte Nacht die große Leuchtreklame ins Zimmer. Die Zimmer sind sehr hellhörig und wenn jemand über den Flur läuft knarrt das Holz. Das Frühstück ist sehr sporadisch (Brötchen, Marmelade, Fruchtsaft) und der Raum ist alles andere als einladend um den Tag gemütlich zu starten. Wir fanden als einziges die Lage - die für dieses Hostel spricht. We had a room without a window or any opportunity to get fresh air into it. There was a bad smell from the beginning on. There was only a small window in the bathroom. It was connected to the main hallway, bad air. Due to the little air circulation the ceiling showed a little bit mold. Staff in the hostel was ok. The lady in care of the breakfast was very unfriendly and not willing to refill the spread or jam on the buffet even when we didn't had any. The breakfast itself was extremely simple.